Property Size 969 sq. ft.
Harmony Sol is the perfect spot for your Key West getaway. 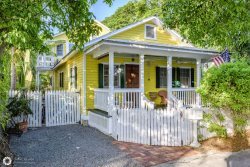 It is located in the middle of Old Town Key West and within walking distance of the best restaurants, art galleries, attractions, shopping and night life. The shotgun-style home, built in 1928 with Dade County pine, provides the historic feel of old Key West but with a private pool and all the modern amenities you need to enjoy your vacation in the tropical island paradise. The two-bedroom, two-bath home features a master suite with a queen bed and an ensuite with a full bathroom. (Shower but no tub). The second bedroom has a full-size bed with twin bunk and twin trundle. Sleeping accommodations also include a queen sofa bed in the living room. The home includes a fully equipped kitchen, central AC, HD cable TV, 50-inch flat screen 3D TV with Skype camera, washer and dryer, lap top computer with 23-inch monitor and high speed wireless Internet. Harmony Sol's private pool has swim jets for swimming laps and is surrounded by a private deck that is assessable from four French doors. Chaise lounge chairs, outdoor dining tables, a gas grill, stereo system with indoor and outdoor speakers and outdoor shower complete the relaxing backyard sanctuary. The home also has a front porch with chairs to watch the world go by. If you want to play, it is a short walk to the beach or fun Duval Street. Great restaurants are close by; Cuban coffee is steps away; Fausto's grocery store is a short walk away. For yoga enthusiasts, step out the door and a one-minute walk will take you to Shakti Yoga. Harmony Sol has it all. Pets: Pets may be allowed on request. Location: In Old Town Key West, just blocks from Duval Street.